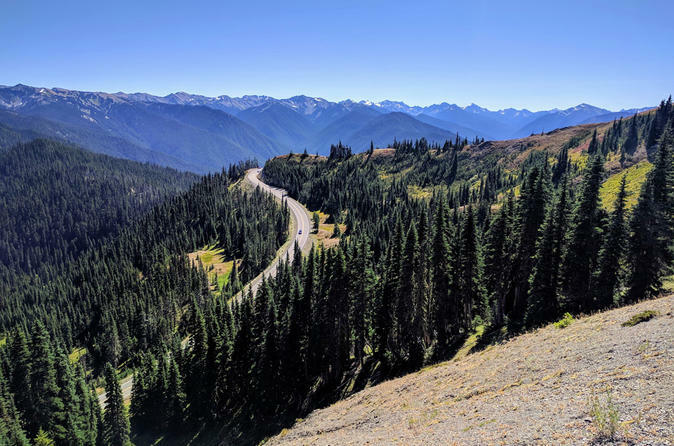 Witness stunning mountain vistas, pristine alpine meadows, and dense old growth forests on this small group day tour to Olympic National Park. We'll start the day with a beautiful ferry ride from Seattle followed by a scenic drive to this UNESCO World Heritage Site, where we'll explore one of the best-preserved natural landscapes in the world. Throughout the day, you'll enjoy meaningful commentary on the history, culture, and geology of the region from an expert local guide. The tour includes a gourmet lunch, park admission, and pick-up/drop-off at your Seattle hotel in our luxury Mercedes van. Our Olympic National Park tour begins with morning pick-up at your hotel in our eight-passenger Mercedes van. We'll board the scenic Bainbridge Island ferry, where we'll enjoy coffee, tea, and pastries while taking in sweeping views of the Seattle skyline and surrounding mountain ranges. While driving to the park, your guide will discuss the fascinating history and culture of the region as we pass several important historical sites. Once we arrive at the park, we'll head straight for Hurricane Ridge. Here, we'll take in stunning views of the Olympic Mountains while walking among picturesque alpine meadows. Be on the lookout for wildlife, including Olympic marmots, black bears, and deer. Your guide will prepare a gourmet locally inspired lunch with complimentary beverages. Our next stop is Lake Crescent, a glacially carved lake set among steep green foothills. Take in the crystal-clear blue waters and visit the historic Lake Crescent Lodge. Afterward, take an optional guided nature walk through an old growth forest to Marymere Falls. Amidst this stunning backdrop, imagine how small geological forces built over time to sculpt the jaw-dropping landscape we see today. On the comfortable ride home, relish the memories and photographs from a great day. Hotel pick-up/drop-off, ferry fare, park admission, and food and drink are all included. Please note that our guides optimize every tour based on the season, weather conditions, and guest interest, so exact stops in the park are subject to change.